Oliver Lee, Los Angeles, CA., won the JDT @ Arcadia by shooting a solid +5 over par 33. 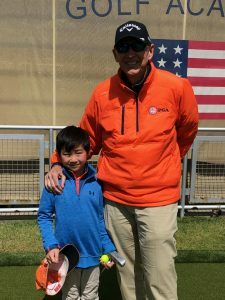 “Big O”, as his coach, George Pinnell, call’s him, was competing in the SCPGA Junior Tour, in the JDT Boys 5-7 Division. 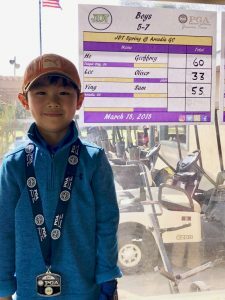 Oliver, playing in his first SCPGA event, started off with a bogey on the opening hole. He came back with a solid par on the second hole followed by a bogey on number three. “Big O” rose to the occasion and made a birdie 2 on the par 3, fifth hole. He backed up his birdie with a solid par on six. Unfortunately, Oliver, finished his round with by going bogey, double bogey, bogey on the closing 3 hole’s. Coach Pinnell, will work with the up and coming player, on learning how to make a strong finish, at the end of a round. Congratulation’s to Oliver and his Team!